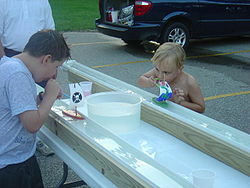 The raingutter regatta is a racing event for Cub Scouts in the Boy Scouts of America. 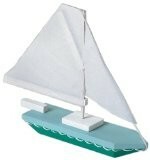 Within the basic design rules, Scouts are free to paint and decorate their sailboats as they choose. 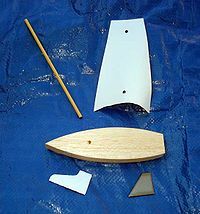 Modifications for speed include the placement of the keel and rudder and the size, shape and location of the sail. A catamaran is an exceptionally fast design, although this modification is not allowed in all races. The boats are raced in a standard rain gutter that is ten feet long, placed on a table or saw horses, and filled to the top with water. the boat cannot be touched with hands or the straw. The first boat to reach the end of the gutter is the winner. The overall winner is determined by an elimination system.